Although I’ve kept up my French (listening to Radio France Internationale), I’ve let slip the Italian – nothing to aim for, as the family holiday to Italia is off for another year (skint). 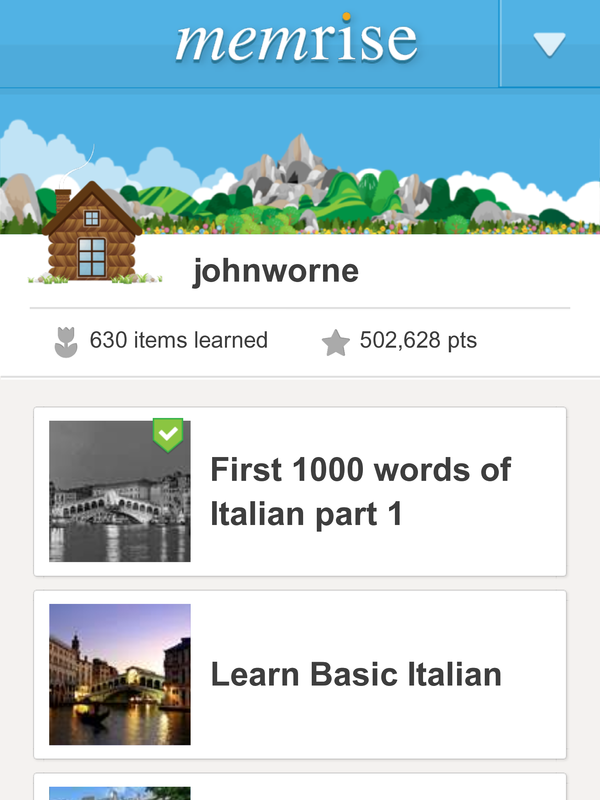 Imagine my surprise today when I sheepishly logged into my Italian course on Memrise and found I can recall the lot – and arguably better than last time I tried it nearly three months ago. What an amazing thing the brain is. It just quietly soaks stuff up, sticks it on an empty shelf; and then serves it up just when you least expect it. Like most tongue-tied Britons, I find it easy to be scared off by languages; but we all speak at least one. With learning apps like Memrise, and foreign language radio (after this I’m tuning into Euronews Radio in Italian again) there’s a whole world of expression to explore. Meraviglioso. Vecchi amici hanno una casa, è vicino al francese e spagnolo che parlo un po ‘, ed è la più bella lingua di tutti – L’italiano è tutta la nostra storia.